Happy New Year and happy first Music Monday of 2018! Honestly I'm pretty pleased that my first post of 2018 has to do with music. 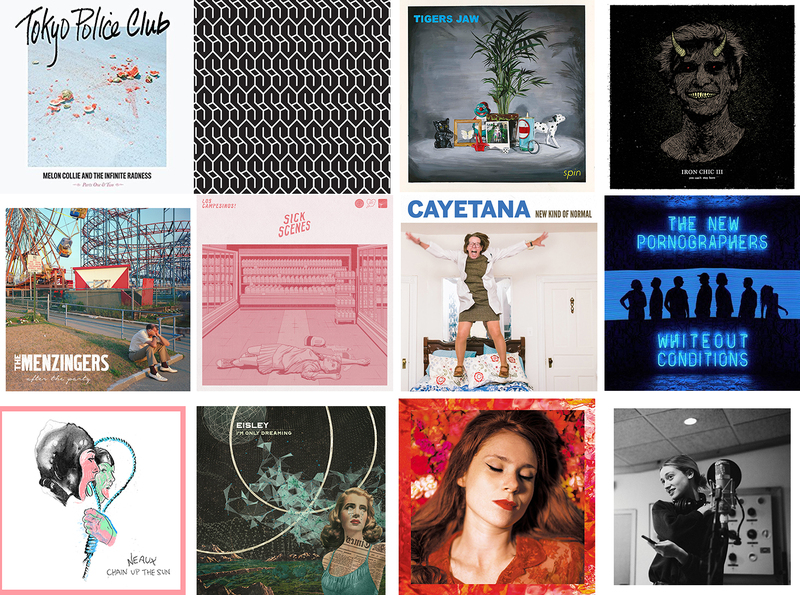 Today I'm rounding up my 10 favorite full length albums of 2017 plus a couple EPs. Last year I had a difficult time narrowing down this list, but this year was even more challenging. I hope you check out at least one of these albums and find something that you like! TPC has been one of my favorite bands for a loooong time. One of my first unofficial (yet kinda official) dates with Spencer was to one of their shows. Their music is just so upbeat and catchy. I've been waiting for this band's comeback for so long. Their debut album, Partie Traumatic, came out in 2008 and I loved it, then they didn't put out any more music till this year. Tigers Jaw is forever one of my favorite bands to chill out to when I don't want to be put to sleep and they only keep getting better, if ya ask me. If you like shout-singing along to songs while you drive, definitely give this a try. Upbeat punk music about getting old. I'm into it. 6. Sick Scenes by Los Campesinos! I've played this album to death this year, I'm pretty sure Spencer would be okay if he never heard it again. I've always liked Cayetana, but this album made me love them. The New Pornos specialize in putting out indie jams that will get stuck in your head forever. Does anyone remember VersaEmerge, or Versa? This is the vocalist Sierra's new project and I am 1000% here for it. If I had to pick one favorite album for 2017, this would be it. I think that's all I need to say. New music from Kate Nash! For the first time since 2013! This EP has me so excited for her next LP that is set to come out in February 2018. I hadn't listened to Petal much before, but this is just too darn good to not include. But also the least upbeat music on this list. And of course, I've already made a playlist for you. Actually, two playlists! I've embedded the playlist of my 12 favorite tracks, but if you want to listen to all 7 hours of all the albums that made this year's list (which you totally should), click here. You can find more of my playlists here or just follow me on Spotify. Please tell me your favorite albums from this year, I'm always looking for music recommendations! 2 comments on "Favorite Albums of 2017"
Sierra is making music again?! I need to Apple Music that right now because she had an incredible voice. I'm still a little gutted that VersaEmerge fizzled out, same with Hey Monday. My album of the year, without a doubt, was Paramore's After Laughter.